In the work bowl of your food processor, pulse chicken thighs, onion, garlic, and pepper until finely ground. 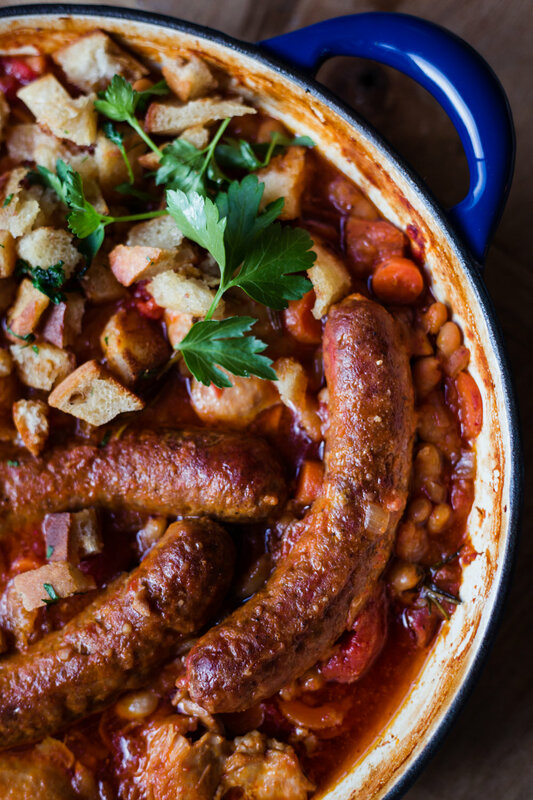 Heat olive oil in a large skillet with tall sides over medium-high heat and add ground chicken. Season with soy sauce, chili paste, and salt to taste. Brown chicken until golden and completely cooked through and drizzle with sesame oil. To assemble lettuce cups, wash and quarter iceberg lettuce. 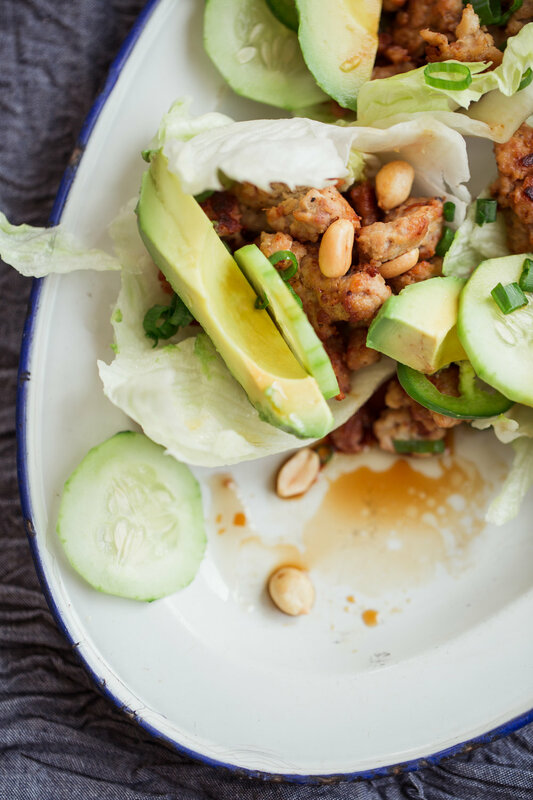 Peel off 2-3 leaves from each quarter, then fill with cooked chicken, sprinkle with peanuts, and top with fresh California avocados, jalapeño, cucumber, and green onions. 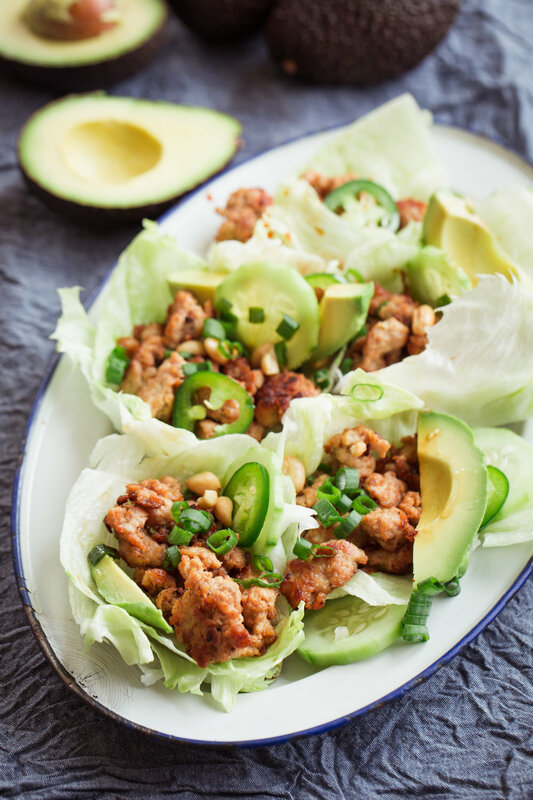 Add an extra drizzle of sesame oil, soy sauce, and/or chili paste over the lettuce cup. Yay, it’s avocado season, and we’re obsessed, everybody! 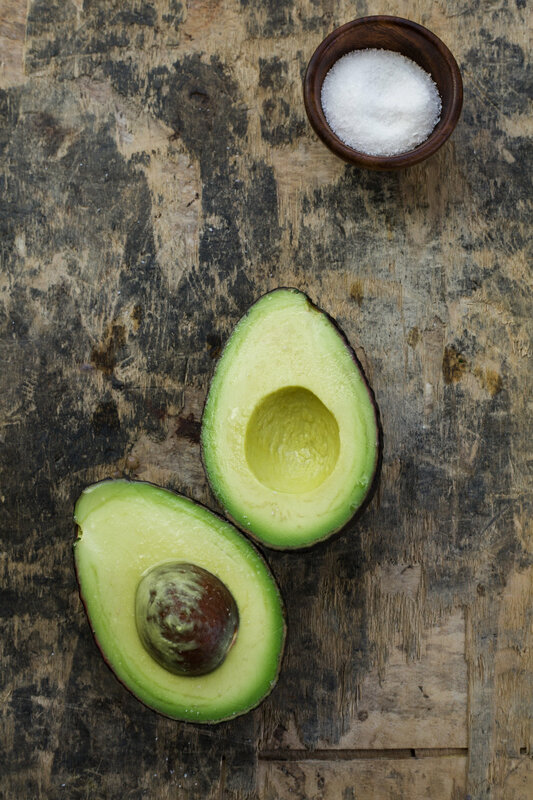 Fresh California avocados are a vibrant, flavorful fruit that are not only delicious — they’re in season, which is good news for all of us. These avocados are great for lunch and dinner, but today we’re doing breakfast and there’s no better way to start your day than with the fruit that’s tasty, healthy, and, let’s be honest, pretty to look at. 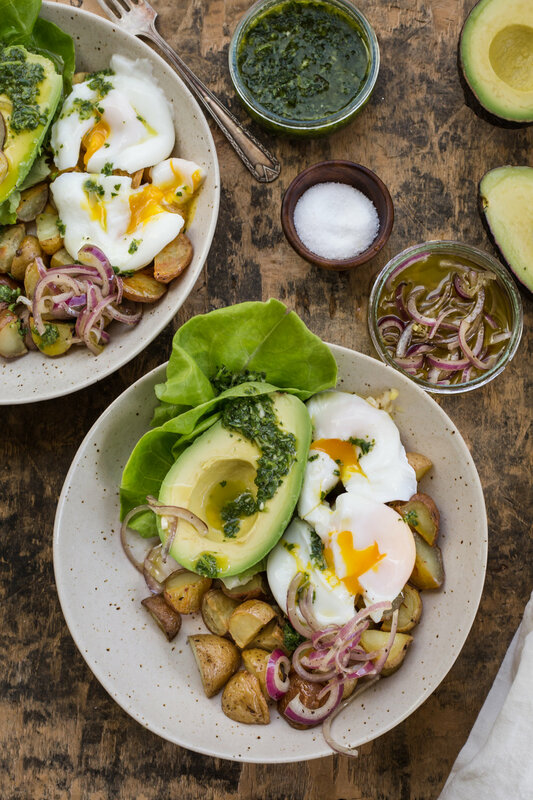 These fresh California avocado & chimichurri bowls are just plain good! Make ‘em and see for yourself! They also happen to be #whole30. Preheat oven to 375°F. Line a baking sheet with parchment and add potatoes, olive oil, and salt and pepper to the pan. Gently toss to coat the potatoes with the oil, salt and pepper. Bake 30-35 minutes. Bring 4 inches of water to a simmer and gently crack eggs into the simmering water. You can safely poach up to 3 eggs at a time. Do not disturb the egg for 30 seconds. Do not allow water to boil. Using a slotted spoon, gently move egg around to ensure even cooking. Ninety seconds produces a perfect poach. 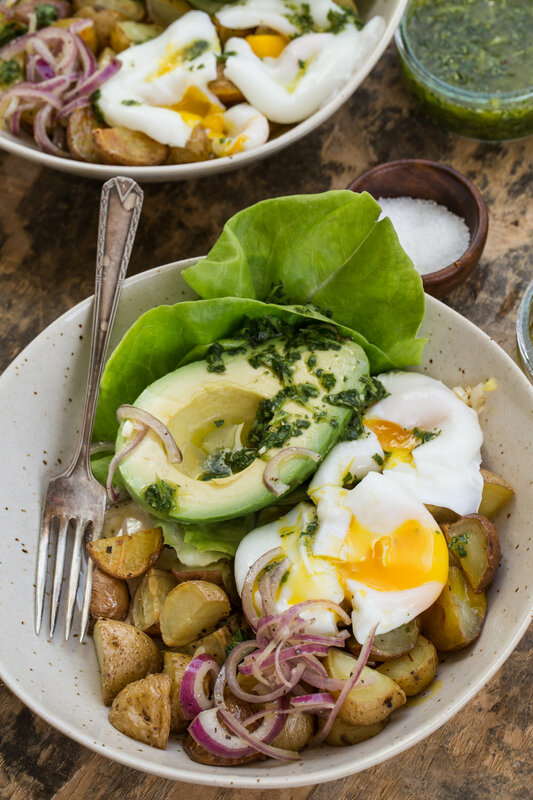 To assemble the bowls, layer lettuce, potatoes, 2 poached eggs, chimichurri and an avocado half topped with marinated onions in each bowl. Sprinkle flaky salt on top of each bowl and enjoy! Pulse all ingredients in a food processor until finely chopped but not puréed, keeping a bit of texture. This keeps 3-4 days in the fridge. Bring to room temp to serve. 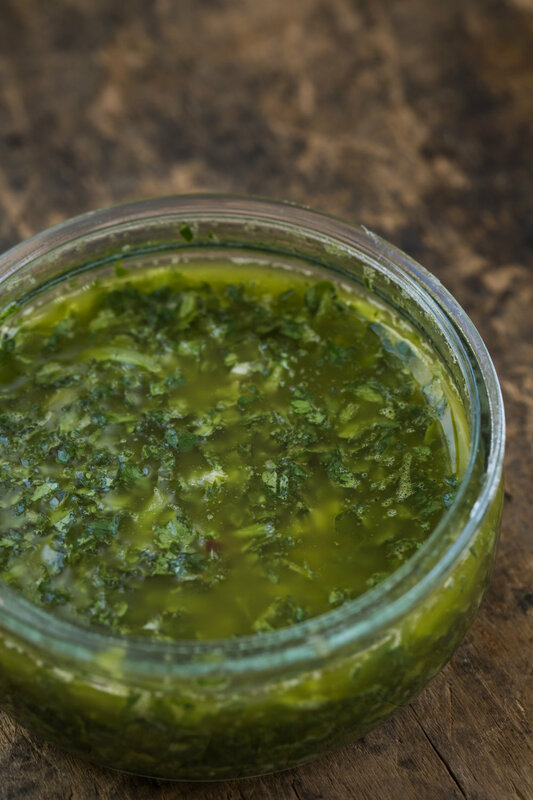 Add all ingredients to a bowl and allow to marinate for 2 hours before use. These are best eaten within 48 hours. Store in the fridge.